With the new school year underway, I often think back to the few precious months I spent homework-free. My summer, however, was very different than that of many of my classmates. As a high school junior, I was given the opportunity to work in Professor Leonard Brillson’s Surfaces and Interfaces Laboratory at The Ohio State University. In April of this year, Prof. Brillson came to my school, Columbus School for Girls (CSG), and gave a presentation about the research his lab conducted. As soon as he introduced his topic of semiconductors I was lost. I spent the rest of his twenty-minute presentation trying to piece together what I did understand from his PowerPoint (which was not much) and form a picture of his research. The questions running through my mind were endless but the few that bothered me the most were, could I work in a university lab with my one-year knowledge of high school physics? Was I smart enough? Pushing my low self-confidence aside, I submitted my resume, thinking it could not hurt. It was not until Dr. Sweeney, who organized this program from the CSG end, informed me that I had been placed in Prof. Brillson’s lab, did the feelings of nervousness and anxiety return. My first day of work was a blur of tours, filling out paperwork, and many handshakes. Having four other CSG girls participating in the program with me made me feel much more comfortable but once we split up to meet our mentors, I was on my own. After navigating through the Physics Research Building, I finally found my way to the office of post doctoral researcher Dr. Snjezana (Snow) Balaz. As soon as I met my mentor for the rest of the summer, I felt at ease; she was incredibly friendly and easy to converse with as we toured the different labs. Even though I did not know some of the terminology she used, and could not have told you the long names of the different machinery after she said them, I still learned an immense amount that first day. Evan, a graduate student in the group, helped Snow explain to me the concept of radiative recombination when showing the Depth-Resolved Cathodoluminescence Spectroscopy (DRCLS), an instrument I used throughout my internship. The rest of summer followed the tone of that first day, learning more and more about how the instruments work, and what physics they study. Not long after, I was also able to learn how to take data on my own. 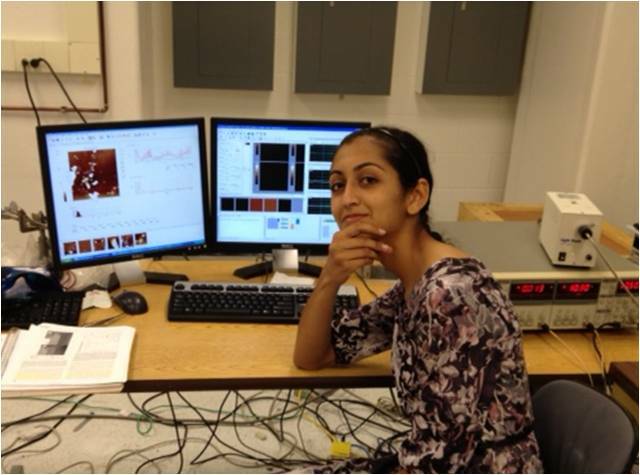 One of the most rewarding experiences was learning how to use DRCLS and be sent by Dr. Balaz to the lab to take data on a few samples of zinc oxide (ZnO) that were being used for collaboration with the Seebauer Group from University of Illinois. The purpose of this collaboration is to see if the defects are driven by electrostatic or thermodynamic forces. After taking data, I learnt how to use a software program called Origin in order to analyze peak intensities and provide Dr. Balaz with graphs to include in a report that was sent to the other group. I also got over my apprehension towards asking questions, and am grateful for Dr. Balaz’s patience. She told me it was better to ask questions than to assume an answer, because assumptions can lead to many more mistakes. I took that advice very seriously and made sure to clarify anything I was unsure about. I also was able to build my self-confidence and noticed a significant change when explaining what I was doing to my family. The true test arrived on the day of my final presentation, when I had to explain concepts that were still relatively new to me, to Prof. Brillson, Dr. Sweeney and the other CSG girls. The nervousness stayed with me up until I took the stage. Once I started my PowerPoint, I knew what I wanted to say and felt comfortable presenting the data; this was one of my proudest moments. The learning did not occur solely in the labs or through the whiteboards in the office. I also had the opportunity to attend group meetings, talks, lectures, tour different labs, and met researchers from the Air Force Research Laboratory. Dr. Balaz was a great teacher, and also acted as a resource for all of my questions, giving me advice regarding choosing majors in college, undergraduate research, and career options. Even though I am a high school student, and graduate school seems many years away, it was nice to have someone to talk to about the process. Dan, a graduate student working in the same office as Dr. Balaz, also became an advisor to me and answered my questions about his undergraduate and graduate school experiences at OSU. I knew how lucky I was to have so many people willing to talk to me about their experiences, and help me think ahead to my future. I can confidently say that taking advantage of the opportunity to work in Prof. Brillson’s lab this summer was one of the best decisions I have made. I am proud of everything that I have learned and accomplished in such a short period of time, and am not sure I would have achieved this level of personal satisfaction from another job. I’ve opened my eyes and mind to the world of research, and found that I enjoyed every minute I spent in those labs. Thank you Prof. Brillson, Dr. Sweeney, for organizing this program, and thank you to Dr. Balaz, Dan, Chung-Han, Evan, Mitchell, and Jackie, for welcoming me into the group and taking the time to explain to me the different aspects of your research. It truly was a memorable summer. Taking data on the Atomic Force Microscope, measuring forces between the tip and the sample to obtain the topography of the ZnO sample. I was born and raised in Lancaster, Ohio and am currently a senior at Columbus School for Girls. I am unsure of where I will be attending college next year but I plan to major in either chemical engineering or biomedical engineering. Wherever I attend college, I hope to become involved in some form of research. Any advice or comments are welcome!